Haq's Musings: Goldman's O'Neill "Disappointed" as India "Explodes"
Goldman's O'Neill "Disappointed" as India "Explodes"
Noting India's significant dependence on foreign capital inflows, Jim O'Neill went further and raised a concern about the potential for current account crisis. "India has the risk of ... if they're not careful, a balance of payments crisis. They shouldn't raise people's hopes of FDI and then in a week say, 'we're only joking'". "India's inability to raise its share of global FDI is very disappointing," he said. United Nations data shows that India received less than $20 billion in FDI in the first six months of 2011, compared to more than $60 billion in China while Brazil and Russia took in $23 billion and $33 billion respectively. Stocks in all four countries have underperformed relative to the broader emerging markets equity index, as well as the markets in the developed nations. 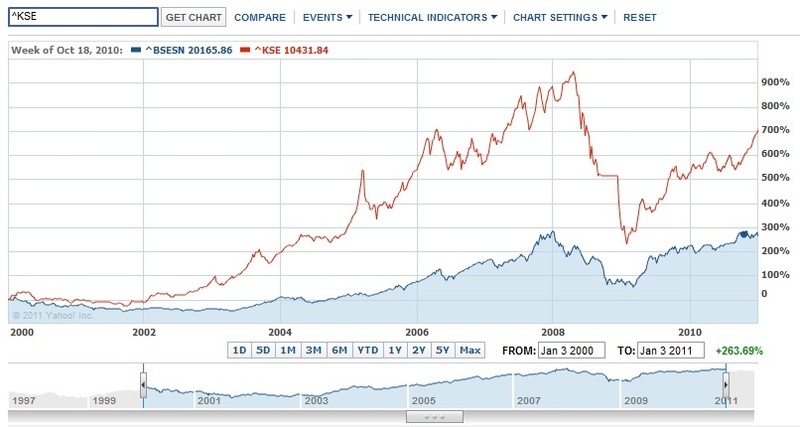 Pakistan's KSE-100 has significantly outperformed all BRIC stock markets over the ten years since BRIC was coined. As India's twin deficits continue to grow and the Indian rupee hits record lows relative to the US dollar, there is pressure on Reserve Bank of India to defend the Indian rupee against currency speculators who may precipitate a financial crisis similar to the Asian crisis of 1997.
ok As a percentage of GDP India is # 2 among the BRIC and Russia is ahead because most of the investment is in oil as it is the world's largest oil producer. Anon: "ok As a percentage of GDP India is # 2 among the BRIC and Russia is ahead because most of the investment is in oil as it is the world's largest oil producer. " Yes, but India depends on foreign capital inflows (FDI+FII) to balance its current account ....a fact that makes India much more vulnerable than China or Russia. But yes some caution is warranted! Anon: "well the CAD is worst case $60 billon...after $40 billion FDI (the six month figure X2 )it is $20 billion..even if it is $30 billion..it becomes $30 billion..."
Yes, if the situation remains steady. 1. With the alarm raised by Goldman Sachs, UBS and Deutsche Bank, the FDI and FII inflows are likely to continue to decline. 2. Indian exports are likely to suffer with Europe in crisis, and this could make India's trade deficit worse. 3. There could be rapid decline in reserves if RBI decides to intervene in currency markets, precipitating a balance of payments crisis. If it doesn't intervene, rising inflation would hamper economic growth and further reduce investor confidence. It's a tough situation for Indian policy makers. Thanks. I agree with this analysis. Incidentally, foreign debt worth 100 billion dollars is due for payment by June 2012. There is an option of rolling it over but then interest costs will rise only further. When the big deal defence contracts now being signed come up for payment over the next few years, the situation will get worse. I am afraid we are getting into a debt trap situation as health expenditure has to be tripled if we want to improve human development parameters. India’s industrial production shrank in October for the first time in more than two years, adding pressure on the central bank to pause this week after a record run of interest-rate increases. Output at factories, utilities and mines fell 5.1 percent from a year earlier after a revised 2 percent gain in September, the Central Statistical Office said in a statement in New Delhi today. That’s the first decline since 2009 and compares with the median estimate for a 0.7 percent drop in a Bloomberg News survey of 24 economists. Manufacturing has moderated in nations from China to Brazil as Europe’s debt crisis saps global growth, prompting officials to hold or lower borrowing costs. Prime Minister Manmohan Singh’s efforts to bolster the Indian economy have been hampered by corruption scandals, inflation and the decision last week to stall the easing of investment rules for foreign retailers. Prior-Wandesforde expects the Reserve Bank to keep the repurchase rate at 8.5 percent in the Dec. 16 policy meeting. India’s inflation rate has exceeded 9 percent every month this year as the rupee’s 14 percent slump against the U.S. dollar during the period, Asia’s worst performance, adds to the cost of imported goods. 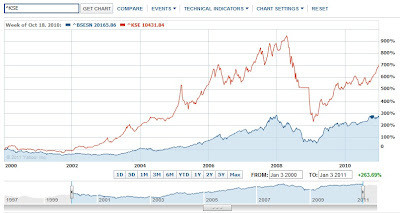 The BSE India Sensitive Index has lost a fifth of its value in 2011. India’s benchmark wholesale-price inflation probably eased to 9.04 percent in November from 9.73 percent in October, according to the median of 24 estimates in another Bloomberg News survey. That would still be higher than the levels in Brazil, Russia and China, which including India make up the so- called BRIC nations. India’s commerce ministry will unveil the data on Dec. 14. Consumer prices rose 6.6 percent in Brazil, 6.8 percent in Russia and 4.2 percent in China last month. Reserve Bank Governor Duvvuri Subbarao has raised the repurchase rate by 375 basis points since the start of 2010. That’s the fastest round of increases since the central bank was established in 1935, Bloomberg data show. Consumer demand has begun to wane as a result of higher borrowing costs. The Society of Indian Automobile Manufacturers may cut its annual domestic passenger-car sales target as costlier loans and fuel prices sap demand for Maruti Suzuki India Ltd. and Honda Motor Co. vehicles, Sugato Sen, a senior director for the group, said last week. Singh, halfway through his second term, is under pressure to revive a legislative agenda derailed by graft allegations in the award of telephone licenses and street protests against inflation. His government faces at least five regional elections next year, including one in Uttar Pradesh, India’s most populous state. The government on Dec. 7 was forced to suspend a decision to allow overseas retailers including Wal-Mart Stores Inc. to open supermarkets amid protests by the opposition and its allies that forced repeated adjournments of parliament for two weeks. There could be rapid decline in reserves if RBI decides to intervene in currency markets, precipitating a balance of payments crisis. If it doesn't intervene, rising inflation would hamper economic growth and further reduce investor confidence. Please explain the link between a weaker rupee and inflation. Except oil which is sold under an administered price mechanism most of the constituents of the inflation basket are indeginous to India. Anon: "Please explain the link between a weaker rupee and inflation." From electricity to telecom to transport vehicles, most of the items of daily use in India rely on imported components. Take infrastructure for example. Every one uses it, and India imports most of the infrastructure equipment in power and telecom sector. India imports various chemicals, gypsum and cement from Pakistan, etc etc. And oil is a big part of the imports. The fact that Indian govt subsidizes it doesn't mean it doesn't cost Indian treasury and tax payers. These subsidies also worsen India's twin deficits which affect rupee valuation. Net-Net the government makes massive money on sale of petroleum products via petrol taxes well in excess of subsidies given and are the biggest source of funds at the state level. Ever wondered how India's tax/GDP ratio is higher than China? Anon: "except telecom equipment India is a net exporter of infrastructure goods.Please check trade figures..capital goods exports are #2 after ITES and software..."
Then why does India run such huge trade deficits? What do you import from China? Power and telecom equipment. And what do you export to China? Iron ore is India's biggest export to China. Please check your facts. In spite of Gandhi's Swadeshi movement and Indian policy of developing self-reliance, the nation remains heavily dependent on imports from China for its critical infrastructure, and its growing appetite for weapons systems on Russia and Israel. These growing imports are fueling India's current account deficits, and adding to its paranoia with regard to the rise of China. In response, Indian government is acting to reduce dependence on Chinese imports, a move that will likely add further to its trade imbalance because of the higher costs of imports from non-Chinese and non-Russian sources. Anon: "Net-Net the government makes massive money on sale of petroleum products via petrol taxes well in excess of subsidies given and are the biggest source of funds at the state level." If that is true, then Indian govt is passing oil price increases to the consumers which will fuel inflation as the rupee falls. I have the main export markets for India's infrastructure goods are South America,Asean and Africa. In volume this is more than what is imported from China. But overall India's uncovered CAD should be less than 1% this fiscal,well well below comfort levels. Industrial output fell 5.1 % from a year earlier in October, after a 1.9% expansion in September, dragged down by a contraction in manufacturing and mining production, government data showed Monday. The reading widely missed the median estimate in a poll of 15 economists for a contraction of just 0.55%. Industrial output last fell in June 2009, when it shrank 1.8%. Government bonds rose following the data amid growing expectations the RBI will hasten a rate cut. The benchmark 7.80% 2021 bond rose to 101.85 rupees from 101.76 rupees before the data and closed at 102.26 rupees. Economists said a rate cut may come early next year if inflation continues to decline over the next few months. "While the governor of the RBI continues to stress that he is more concerned about inflation than growth, this is the sort of number that will surely make him sit up and take notice," said Robert Prior-Wandesforde, director of Asian Economics at Credit Suisse. The RBI, which has raised interest rates 13 times since March 2010, has previously said the likelihood of another increase at its next policy review on Dec. 16 was low. Despite headline inflation likely remaining elevated at about 9% for November, the sharp contraction in production could prompt some monetary measures at the policy meeting this week, added Citigroup economists Rohini Malkani and Anushka Shah. Monday's data showed that manufacturing output, which has a 75.5% weighting in the index of industrial production, fell 6% from a year earlier in October, compared with a 2.4% rise the previous month. Mining output shrank 7.2%, after falling 5.6% in September. It's ironic that you question the consumer growth story in India, when O'Neill's disappointment arose out of the fact that policy flip flops disallowed the likes of tesco, walmart and carrefour to profit from the multi billion dollar indian retail space. In other words, if India's consumer growth story was under question, there would not have been any ripples in the global biz circles because of India’s moves on FDI in retail. The "disappointment" arises from recognising the inability to profit from the vast the potential that india holds. As for the CAD, trade imbalances and the rupee fall - as you so ardently believe - a glass can either be seen as half full or half empty. For those who appreciate how market economics work, there are clearly two very visible aspects of the rupee fall. While, it's true that the it hits the import bill, it is also true that a devalued rupee makes indian exports more competetive. The rupee's fall gives it an edge over the yuan. With the Indian services sector contributing, vastly, to the GDP - the services exports will benefit from the sharp rupee falls. Extrapolating from the rupee-export co-relation - the falling rupee should aid the exports, allowing for bridging the trade deficit and also allowing the inflow of dollars that would help plug the leaking CAD. The Indian policy makers are lost in a maze that they themselves created. The investors, global and domestic, are nervous - as they should be. The growth numbers are looking increasingly fragile, but to start pondering over an obituary is insane. Besides, Mr. Haq, allow me to point out to you a dichotomy. You reject my claims of India's potential as a superpower, when I quote Goldman Sach's (GS) reports. You dismiss the projections and refer to the likes of GS as "dangerous" and "unhealthy" for the economy. Yet, you endorse the "dangerous" and "unhealthy" claims of GS when its suits your end of running down India. But how about some perspective?! Despite the nervous situation that india finds itself in, it continues to perform better than pak on most economic indicators - such as inflation, unemployment, growth, forex reserves, growth in exports, etc. Drawing conclusions about pak based on indicators used in your analysis - such as rupee, trade imbalance, forex reserves, inflation - will present a feeble picture of pak. For instance, the trade deficit for nov 2011, shot up by 55.5% YOY and by 48.7% for the first 5 months. Meanwhile, quantum of exports fell by 13% in Nov 2011 YOY. Meanwhile, for the same period, imports soared by nearly 20%. But the import bill is set to get worse as the pak rupee (like its indian counterpart) also hit record lows. So with pak importing about 80% if its oil needs, the writing, it seems, is on the wall. And i assume that we're only too aware of the expected domino effect that expensive crude will have on inflation in pak (higher than india). A reuters report claims that, "With dwindling reserves, coupled with import payments, debt servicing and a lack of external aid, the pressure on the local currency is expected to continue." Moreover, the CAD situation and the potential for BOP crisis (just like 2008 when pak had to go begging to the IMF for 11 billion USD) cannot be ruled out. Pak's CAD in July-Oct increased to 1.55 billion USD as compared to 541 million USD in the same period last year. If not the quantum of the deficit, then the pace at which it increased should worry you. As for stable inflow of foreign investments - according to the SBP - Foreign Private Invesments in pak for july-oct fell by 61%, while FDI for the same period fell by 27.7%. Here's some food for thought - if according to you Pak is too big to fail with an GDP of 175 billion, what does it mean for india with a GDP of 1.73 trillion?? India’s commerce ministry said it overstated merchandise exports by $9 billion in the eight months through November because of “misclassification and errors” in computing overseas sales. “Notwithstanding the misclassification, there were errors in double counting and all sorts of things which inflated exports by about $9 billion,” Commerce Secretary Rahul Khullar told reporters in New Delhi yesterday. Overseas sales in the April-to-November period now stands at $192.7 billion, Khullar said. India’s monthly export growth has averaged about 44 percent since April even as Europe’s debt crisis and a faltering U.S. recovery reduced global consumer demand, prompting economists to question the quality of the data. Today’s revision explains “in part the weakening of the rupee,” Asia’s worst-performing currency this year, said Jay Shankar, Mumbai-based economist at Religare Capital Markets Ltd. The rupee weakened 0.6 percent to 52.04 per dollar in Mumbai yesterday, extending its decline this year to 14.1 percent. The BSE India Sensitive Index (SENSEX), which has lost a fifth of its value in 2011, dropped 1.7 percent. The yield on the 8.79 percent bonds due November 2021 rose two basis points, or 0.02 percentage point, to 8.54 percent. India’s exports in November were $22.3 billion, Khullar said, without elaborating. Bloomberg calculations based on previously announced data show exports grew 3.7 percent last month from a year earlier, the slowest pace in more than two years. The South Asian nation’s imports in November were $35.9 billion, he said. Imports in the eight months through November were $309.5 billion, causing a trade deficit of $116.8 billion in the period, Khullar said. India will get “close to, but not quite $300 billion in exports” in the year ending March 31, he said. The South Asian nation’s export growth has vacillated this year, surging 82 percent in July before slowing to an 11 percent gain in October, according to previously reported data by the commerce ministry. A report by Mumbai-based Kotak Institutional Equities Research in October showed “wide gaps” in engineering export numbers released by the government and data culled from annual reports of the top 500 companies on India’s exchanges for the year ended March 31. While official announcement showed engineering exports jumped 79 percent to $68 billion in the year through March, data collected by Kotak from company reports indicated only an 11 percent increase to 638 billion rupees ($12.3 billion) during the period, according to the report written by Sanjeev Prasad, Sunita Baldawa and Amit Kumar. The Indian rupee partially recovered from a fresh record low against the U.S. dollar Tuesday, aided by a late rebound in local stocks and as the euro pared its losses. The dollar was at INR53.22 late Tuesday, after touching an intraday high of INR53.515, and compared with INR52.84 late Monday. The greenback's previous record high was INR52.85, on Monday. The rupee has borne the brunt of global risk aversion emanating from the euro-zone crisis and due to concerns over high domestic inflation, slowing growth and a possible widening of the federal government's budget deficit. The dollar has gained nearly 19% against the rupee since March, making it Asia's worst-performing currency this year. The rupee could easily be set to fall to as much as 55 to a dollar by the end of the year, as unhedged local firms rush for cover on their dollar debt, said Ashish Vaidya, head of trading at UBS in India. Local authorities are making efforts to boost foreign-exchange supplies to help arrest the rupee's slide against the U.S. dollar, the junior minister of finance said. "The finance ministry has been keeping a close watch on the situation," Namo Narain Meena said in the upper house of parliament. A subcommittee of the Financial Stability and Development Council, headed by Reserve Bank of India Governor Duvvuri Subbarao, is also continuously assessing the matter, he added. The Bombay Stock Exchange's Sensitive Index rose 0.8% to end at 16,002.51, recovering from its intraday low of 15,771.59. Meanwhile, Indian government bonds rose on investors' expectation that moderating economic growth will allow the central bank to take a dovish stance and ease policy rates sooner than expected. The 8.79% 2021 bond ended at INR102.55, up from INR102.26 Monday. The Reserve Bank of India is likely to pause tightening interest rates at its rate-setting meeting Friday, after 13 increases since March 2010. "But a fast depreciating rupee may add to some imported inflation as India buys about 80% of its crude oil need," said a senior dealer at a state-run bank. The market is awaiting November's inflation data, due Wednesday. According to the median estimate in a Dow Jones Newswires poll of 15 economists, the wholesale price index likely rose 9.04% in November from a year earlier, compared with a 9.73% increase in October. i agree. India fiscal deficit and balance of payment deficit in the current account is the main reason for the ruppee falling suddenly as the capital inflow has stopped for whatever reason. this gives an opportunity for the country to understand that current account deficit is something which is dangerous and it requires to be kept under control. EXPECTATIONS for India’s economic growth rate have been sliding inexorably. In the early spring there was still heady talk about 9-10% being the new natural rate of expansion, a trajectory which if maintained would make the country an economic superpower in a couple of decades. Now things look very different. The latest GDP growth figure slipped to 6.9% and industrial production numbers just released, on December 12th, showed a decline of 5.1% compared with the previous period, a miserable state of affairs. The slump looks broadly based, from mining to capital goods, and in severity compares with that experienced at the height of the financial crisis, in February 2009, when a drop of 7.2% took place. Bombast is turning to panic. Dec. 19 (Bloomberg) -- Truck driver Sujan Singh should be delivering cars to Mumbai from Maruti Suzuki India Ltd.’s plant near New Delhi. Instead, he’s sitting at a roadside cafe by one of India’s busiest highways, waiting for the traffic to ease. India’s failure to upgrade its 4.2 million kilometers (2.6 million miles) of roads, close a 10 percent power deficit and ease congestion at ports is hobbling the central bank’s efforts to beat inflation. Even after raising interest rates by a record 375 basis points in 1 1/2 years, wholesale prices have risen more than 9 percent for 12 straight months. The bank says supply bottlenecks that push up costs must be tackled. The country of 1.2 billion people is paying for two decades of neglect. While China 20 years ago went on a multitrillion dollar spending spree for roads, railways, ports and power stations, its South Asian neighbor concentrated on services. Now, as China reins in prices and expands industry inland to restrain wages, India’s near record-low rupee and price gains are damping consumer spending and choking off company earnings. Sikka said Havells has to pay higher packaging costs to protect lamps and switchgears from India’s bumpy roads, where average speeds are 20 kilometers per hour (12 mph). Businesses from Maruti to soap and food maker Hindustan Unilever Ltd. also suffer, said Jagannadham Thunuguntla, chief strategist at SMC Wealth Management Services Ltd. in New Delhi. In a tough message to India Inc, Prime Minister Manmohan Singh urged industry leaders to stop negative comments, and pitch in to help India grow. "I must confess that it is a little disappointing to sometimes hear negative comments emanating from our business leadership or be told that government's policies are causing slowdown and pessimism in the industrial sector. Such comments have added to uncertainty and have emboldened those who have no stake in our economic growth. It is true that our country faces a large number of issues which need urgent resolution. The energy sector, the port sector, the transport sector, the supply of gas and coal, all need greater attention. Corruption and better governance also require firm handling. I wish to assure you that our Government is serious about tackling these issues. We are also committed to ensuring the predictability and transparency of our policy and regulatory environment," the Prime Minister said. These comments were a part of PM's remarks at a meeting of the Council on Trade and Industry held yesterday evening. India Inc met the PM to discuss concerns over economic slowdown, high interest rates and lack of reforms. Those present at the meeting included Tata Sons Chairman Ratan Tata, Bajaj Auto Chairman Rahul Bajaj, Reliance Industries’ Mukesh Ambani, former Chairman of Infosys NR Narayana Murthy, Bharti Airtel's Sunil Mittal and ICICI Bank's Chanda Kochhar. Commerce and Industry Minister Anand Sharma and Deputy Chairman of the Planning Commission Montek Singh Ahluwalia also attended the meeting. Pakistan's key share index KSE-100 dropped about 5% in 2011, significantly less than most the emerging markets around the world. Mumbai's Sensex, by contrast, lost about 25% of its value, putting it among the worst performing markets in the world. ISLAMABAD: The German embassy in cooperation with the Pakistan German Business Forum (PGBF) and German-linked companies and institutions active in Pakistan held an exhibition titled ‘Germany on the Road’ in Multan. Germany on the Road has been designed to present the multitude of linkages between Germany and Pakistan by giving German companies, Germany-linked companies and German institutions the opportunity to display their activities in Pakistan in a concise and vivid manner. During the exhibition up-to-date information about Germany as well as appealing give-away were handed out and a buffet dinner was offered. The event was sponsored by BASF Pakistan, CEI Logistics, EXCEL Group/PrintSol, GWE German Water and Energy, KSB Pumps, Küppersbusch/Teka Pakistan, MAN Diesel Pakistan, METRO Cash and Carry Pakistan, Nordex SE Germany, SAAS Synergie/Alno and SAP Pakistan. I am surprised that Siemens Pakistan is not at the event. Southeast Asian nations are swallowing an outflow of money from India, as foreign investors lose patience with its policy paralysis and slowing growth and aim instead for more promising emerging markets such as Indonesia. Corruption scandals and high inflation have added to India's woes, which have seen growth slow to a three-year low while the fiscal deficit widened to 5.9 per cent of GDP in the last financial year. "India was sold on the promise of high growth which simply hasn't panned out over the past four years," said Gautam Prakash, founder of US based hedge fund Monsoon Capital. Foreign investors pulled a net $540 million out from India in March and April, compared with $13 billion in inflows in January-February. Among the most significant developments from the shift has been the direction in which money is headed - with a big chunk flowing to Jakarta and other Southeast Asian capitals. Two provisions put forward in the budget to tax indirect investments and combat tax evasion were the last straw for some global mutual funds, prompting an acceleration of money leaving India. While the provisions were later put on ice, the prospect that such a tax could be proposed in India was enough for some investors to send their Asia-allocated money further east. "You're seeing a situation where the 'I' in BRIC is being replaced by Indonesia," said Tim Condon, head of research and strategy for Asia at ING. An emerging market brochure distributed by Franklin Templeton last month had data on India missing from a world map. From a global leader in emerging market investing, led by omnipresent guru Mark Mobius, that omission was telling. India exposure in Asia's biggest equity fund, the $18 billion Templeton Asian Growth fund, dropped to 16 percent of its assets at the end of March from nearly 20 percent a year ago, while exposure to Association of Southeast Asian Nations countries rose to 35 percent from 31 percent during the period. An ASEAN-focused equity fund launched by Daiwa Asset Management started with about $366 million in February and has since grown to manage about $430 million, while Fidelity Funds-ASEAN has seen a net inflow of nearly $250 million in the last year. The bigger ASEAN markets do not necessarily offer a compelling case on valuation grounds. "Generally we are more negative on India than we are positive on the alternatives, such as Indonesia and the Philippines where we feel the markets have perhaps run ahead of themselves," said David Baran, co-founder of Tokyo-based hedge fund Symphony Financial Partners. "However, the ASEAN alternatives do have more positives and less negatives than India and we think that foreign investment outflows from India into the ASEAN alternatives are highly likely to increase if anything." Indian shares trade at price to book value of 1.9 times, higher than 1.4 times for Asia Pacific shares as a whole but less than 3.1 times for Indonesia, 2.2 times for Thailand and 2.5 times for Philippines, according to data from Thomson Reuters StarMine. The trend, nonetheless, is clear as money managers shift away from India, at least for the short-term, towards markets that offer the same favourable demographics and growth potential that had previously drawn investors to Delhi and Mumbai..
India's financial woes are rapidly approaching the critical stage. The rupee has depreciated by 44% in the past two years and hit a record low against the US dollar on Monday. The stock market is plunging, bond yields are nudging 10% and capital is flooding out of the country. The trigger for the run on the rupee has been the news from Washington that the Federal Reserve is considering scaling back - "tapering" - its bond-buying stimulus programme from next month. This has consequences for all emerging market economies: firstly, there is the fear that a reduced stimulus will mean weaker growth in the US, with a knock-on impact on exports from the developing world. Secondly, high-yielding currencies such as the rupee have benefited from a search for yield on the part of global investors. If policy is going to be tightened in the US, then the dollar becomes more attractive and the rupee less so. The day before Indian financial markets had had their rockiest session for many years. The rupee sank and stockmarkets tumbled. Money-market rates rose. The shares of banks thought to be either full of bad debts or short of deposit funding fell sharply. The sell-off had been made worse by new capital controls introduced on August 14th in response to incipient signs of capital flight. They reduce the amount Indian residents and firms can take out of the country. Foreign investors took fright, fearful that India might freeze their funds too, much as Malaysia did during its crisis in 1998. India is not being singled out. Since May, when the Federal Reserve first said it might slow the pace of its asset purchases, investors have begun adjusting to a world without ultra-cheap money. There has been a great withdrawal of funds from emerging markets, where most currencies have fallen by 5-15% against the dollar in the past three months. Bond yields have risen from Brazil to Thailand. Some governments have intervened. On July 11th Indonesia raised its benchmark interest rate to bolster its currency. On August 21st its president said he would soon announce further measures to ensure stability. India, Asia’s third-biggest economy, is more vulnerable than most, however. Economic news has disappointed for two years, with growth falling to 4-5%, half the rate seen during the 2003-08 boom. It may fall further. Consumer-price inflation remains stubborn at 10%. A drive by Palaniappan Chidambaram, the finance minister, to push through a package of reforms and free big industrial projects from red tape has not worked. An election is due by May 2014, adding to uncertainty.